March 4th 2009 will be the fiftieth anniversary of His Holiness Sakya Trizin's enthronement. Sakya centres in Dechen will be taking part in the world-wide celebrations to mark this occasion. On Sunday March 8th, the puja of the Sixteen Arhats will be held in our Sakya centres. Following this, students will have the opportunity to present kataks and offerings to the shrine for His Holiness. We will also be taking part in the celebrations for His Holiness' birthday in September 2009 and helping with preparations for the Sakya Monlam. This event is held annually in Lumbini and this year it will form part of the celebrations for His Holiness' accession; more details will be announced shortly. The dates of H.E. Gyana Vajra Rinpoche's first teaching tour in the UK have just been confirmed. His Eminence, His Holiness Sakya Trizin's youngest son, will visit both Sakya Thinley Rinchen Ling in Bristol and Sakya Dechen Ling in London. He will spend three days in Bristol from Thursday 8th to Saturday 10th October and will travel to London on the Sunday where he will spend a further three days. Further details of His Eminence's teaching schedule will be released shortly. The above dates have now changed. His Eminence's itinerary will remain the same but the dates have had to change. We will provide the revised dates as soon as possible. On Sunday December 21st Lama Jampa visited Sakya Dechen Ling, London to give a teaching which heralded a new chapter for Sakya Buddhism in London. Lama Jampa gave an illuminating discourse on the Sutra of Mindfulness of the Qualities of the Three Jewels. 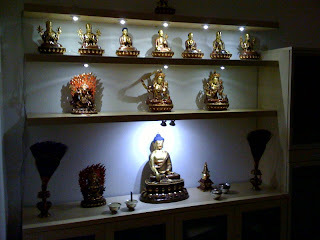 He emphasised the importance of the sangha in maintaining the vitality of the Buddhadharma. The London sangha were immensely grateful that Lama Jampa was able to bestow this teaching and grant his blessings for the future success of Sakya Dechen Ling, London. On Saturday December 20th, members of the London sangha congregated to prepare the centre for Lama Jampa Thaye's inaugural teaching at Sakya Dechen Ling. Sakya centre members enjoyed a day of working together, installing a new lighting system for the shrine, preparing the Lama's throne and building a new prayer cabinet. On the 29th-30th November, the Sakya Centre took part in the fringe North Bristol Arts Trail as it has a large collection of traditional Tibetan art. Despite the cold weather, there was a large number of visitors over the weekend with Sunday being the most popular day. Topics of discussion ranged from the artistic composition of the thangkas to the meaning of the different images. 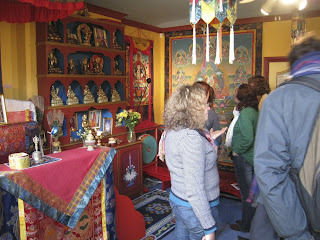 Others also wanted to visit the Centre to discover more about Buddhist activities. The atmosphere at the centre was friendly and busy with over 100 people coming through during the weekend. For all sangha members who were there, it was deemed a great success and a breakthrough in local community relations. The Sakya Centre plans to take part in the main North Bristol Arts Trail next year. 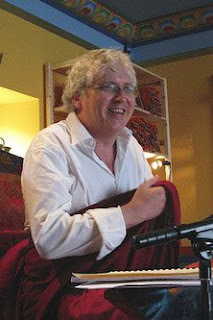 The dates for Lama Jampa Thaye's teaching programme for 2009 to be found on the events page of the Dechen website are now firm. Any changes will be posted on this blog. An article has been added to the Resources page of the Dechen website in which Lama Jampa reflects on the visit of HH the 16th Karmapa to Kagyu Ling in 1977 and looks forward to receiving the HH 17th Karmapa at Kagyu Ling in the near future. On October 30th Lama Jampa, accompanied by Dechen Dolma and a team of three people, flew to Japan to attend the fifth World Buddhist Summit. The Summit was hosted with astonishing courtesy by the Nembutsu school, a recently established Pure Land organisation, in the Royal Grand Hall of Buddhism temple complex close to the city of Kobe. Buddhist teachers from thirty three countries and all traditions of dharma as well as numerous royals and politicians attended the Summit. See a web album of photos. The Summit itself was preceded by the inauguration of the Royal Grand Hall and a ground-breaking ceremony for the future Nalanda University which is planned for the site. Subsequently, the Summit conference ran for four days, commencing with a key-note speech from Ven. Dr. Kyuse Enshinjoh, founder of Nenbutsu-shu. Lama Jampa gave a speech on the three vehicles from the perspective of the Sakya school. The Summit concluded with a round table session and a Press Conference. The resources page has been reorganised to clarify the range of articles that are available. These include general introductions to Buddhism and more advanced explanations on aspects of Vajrayana. Also there have been updates over the last week to Lama Jampa's teaching programme for 2009 - notably an additional teaching to be given in Los Angeles USA in Spring. The German edition of Rain of Clarity: Regen der Klarheit, Lama Jampa Thaye's authoritative work on the Sakya school of Buddhist thought will be published by Tushita in November. Regen der Klarheit will be the second of Lama Jampa's books to be translated into German: his popular introduction to the fundamentals of Buddhism, Die Lehre Vom Gluck (Discovering the Causes of Happiness) was published by Theseus in 1999. Lama Jampa will begin his European teachings in 2009 with a talk at the launch of Regen der Klarheit on Saturday Feburary 14th. The annual Dechen Management Conference was held in London this weekend.The management team from across the UK met to outline their aims and objectives for the next five years and much discussion and sharing of resources ensued. The significant increase in property in several areas of the community led to a focus on building development, renovation and expansion. The international dimension of Lama Jampa Thaye's vision was also represented at the conference. With the steady growth of Dechen both in Europe and in the Americas we can expect to see major developments in these regions during the coming year not least in the publishing arena where dates are currently being finalised for a series of book launches to mark translations of Rain of Clarity- Lama Jampa's seminal work on the Sakya school of Budddhist thought-into German and Spanish. 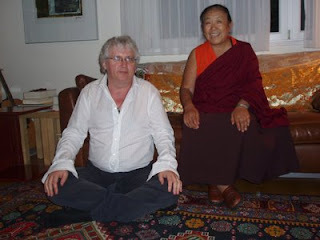 Lama Jampa Thaye gave teachings over a weekend in Southern Germany earlier this month. Sakya Dechen Ling, Stuttgart hosted an evening of questions and answers with Lama Jampa for the local sangha. This was followed by two days of teachings at Karma Lodro Ling in Nurtingen where Lama Jampa completed teachings on the Union of Dzokchen and Mahamudra which he had begun the previous year. Sakya Dechen Ling in Stuttgart was delighted to host a visit by Her Eminence Sakya Jetsun Kushog Chime Luding Rinpoche as part of her recent tour of Europe. Jetsun Kushog gave teachings on ‘Parting from the Four Attachments’ using the commentary of the founder of the Ngorpa School of the Sakya tradition, Ngorchen Kunga Zangpo. In order to bless Sakya Dechen Ling, Her Eminence bestowed the initiation of Red Tara, the ‘Swift Heroine’, from the line of the great Indian master Atisha. The annual Dechen summer retreat was held once again at Sakya Changlochen Ling, our main European Centre in South West France. 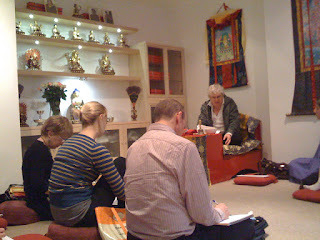 Eighty people attended teachings given by Lama Jampa Thaye on Sakya Pandita's text Discriminating the Three Vows. In the course of the text Sakya Pandita takes the opportunity to offer a masterful critique of some misconceptions regarding the original Dharma teachings which were prevalent in his time. Students attending these teachings were able to see that Sakya Pandita's examples of correct and incorrect understanding all have parallels in our own experience of practising Buddhism today. 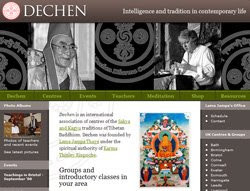 The Dechen Website provides information about Dechen Centres and Groups each of which runs introductory classes. On the website you will find details of when and where these classes take place. 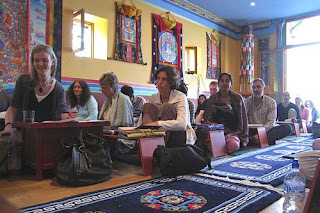 Also there are details of the the major teaching events that take place regularly at the various Dechen centres. Also there are articles about different aspects of Buddhist teachings as well as accounts of the Buddhist traditions to which our teachers belong.